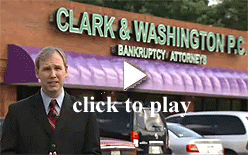 Chapter 7 - Unlike many other bankruptcy firms, Clark & Washington does not charge any up front cost to start your Chapter 7 case. You can pay the attorney’s fee in monthly installments of $250 per month over several months. In most cases, the attorney’s fee for Chapter 7 will be around $1,000. Financial crises sometimes occur when you least expect them. You may learn of a threatened repossession or wage garnishment at 5pm on a Friday, or a deal to stop a mortgage foreclosure may fall through on the Monday prior to a Tuesday foreclosure. Clark & Washington will be there for you at these times of need. Our offices are open late and we can schedule a weekend appointment. Call us any time at 423-634-1910 and one of our attorneys will get back with you within a few minutes. Further, Clark & Washington attorneys can meet you near where you live. We have 3 satellite offices the Chattanooga area, including our main office on Lee Highway, and satellite offices in Hixson and Cleveland. 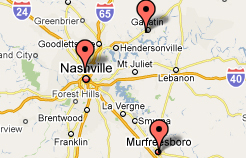 Click here to view a map showing our Chattanooga area locations.